Manufacturer, exporter and supplier of silver payal, silver bracelet etc. 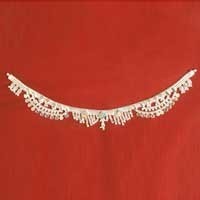 Our company is counted among the reliable Manufacturers, Exporters & Suppliers of Bridal Anklets. The Anklets we make available are embellished with semi-precious stones. We offer these in breathtaking designs. Owing to our brilliant logistics network, we are capable of delivering bulk orders of these within the promised timeframe. Buyers can obtain these at affordable rates from us. Contact us today! Payal is considered as an essential part for completing the attire of an Indian woman. Carrying this spirit forward, we offer a splendid range of Silver Payal to the clients. Designed to perfection our designer Silver Payals are a perfect combination of traditional values and stylish appeal. Ideal to be worn with Indian attire, our Silver Payals enhance the appeal of the wearer. In addition to this, their beautiful carvings and never seen before designs make this variety of Silver Payals Numero Uno. Bandejiya Payals is a one stop destination for designer Silver Bracelets. We offer a wide gamut of Silver Bracelets to the clients. Designed as per the latest market trends, the Silver Bracelets manufactured by us are a perfect choice for stylish appeal and trendy looks. Owing to their exclusive designs and beautiful carving, our Silver Bracelets are surely to vouch for. Moreover, we supply this designer collection of Silver Bracelets in varied sizes and designs, that too at market leading prices. 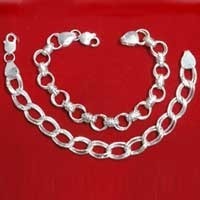 For glamorous appeal and dazzling look, we bring forth an alluring variety of Silver Chains to the clients. Designed to excellence, our beautiful collection of Silver Chains is a perfect match to any kind of attire. Furthermore, our Silver Chains are a perfect mix of contemporary and modern designs. 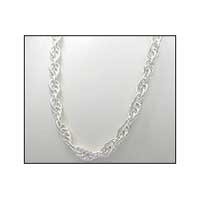 We keep a tab on the prevailing market trends and accordingly design our range of Silver Chains. Our stylish variety of Silver Chains and timely delivery services has facilitated us to be one of the promising Manufacturers, Exporters, and Suppliers of Silver Chain in the world.